It’s time for all of us to think about how mobile affects our businesses. 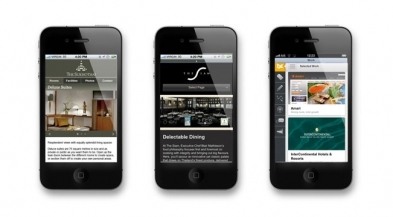 If you don’t have a mobile site now, then you need to call up your developer, talk to your tech team, and make it happen. On the 50 or so sites that we’re currently tracking, we are seeing mobile traffic rising from on average 15% at the end of 2011 to an average of 31% at the end of 2012 — the growth is astounding. It’s clear now that people — normal, everyday people — access websites all the time on their mobile devices. So, now is the time to invest in optimising the user experience. Tablets are quite easy to take care of: most tablets have top class browsers, and unless you still have Flash on your site (hello, 2006? ), then the tablet should show your website just fine, with maybe a few tweaks here and there. Mobile phones are a different story. They really do need special sites that make best use of the screen size of those devices. You should also prioritise the content so that it is relevant and easy to access by the user. An example of this is The Sukhothai mobile site, which has taxi directions in the local language, in this case Thai, so that users can pull the phone out of their pocket, show the directions to the taxi driver, avoiding any miscommunication. Depending on the kind of website you have, this should be relatively straightforward. If you have an existing Content Management System, then your content is in a database already. All you need to do is review the content, decide which types of content are most important to smart phone users, and then design an interface which can drag that content from the database and display it clearly. For the QUO site, we took the content as is, selecting the most relevant items, resizing images, but with very few other changes. When creating the mobile site for The Siam, we added some new content types to the CMS to allow some mobile-only elements. Making your existing content work for you means less management and less cost. However, if you don’t have a Content Management System, there’s never been a better time to upgrade your website to handle both regular web visitors and mobile users.